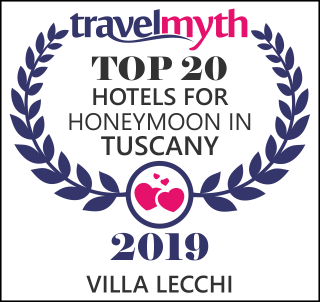 Villa Lecchi, a romantic hotel in Siena, very close to the historic center and immersed in the stunning countryside of the Chianti hills: 4-star of charme near Florence (about an hour far from the most famous landmarks), ideal for a weekend break or an escape from the stress of the life in the cities. On the top of the small medieval village of Lecchi, near Poggibonsi, our hotel overlooks the Chianti hills of Siena and the Val d'Elsa area, near to the main wine routes and the most important tourist sites. Monteriggioni, Castellina in Chianti, San Gimignano, Volterra, Montalcino, Montepulciano and Pienza are just some of the best known destinations that you will easily reach during your holiday. In the areas surrounding the villa you can find some of the best wineries in the world; our staff will be happy to assist you in booking and organizing guided tours, tastings and light lunches. Discover the passion that all the Tuscan producers use to make their own typical products. The mission of our hotel in Siena has always been to create tailored stays for couples, singles or families with children. Our concierge can also provide for transfers to and from any city and airport, as long as the request is made in advance. Live an unforgettable stay, book your room or suite in our hotel 4-star in Siena. Coordinate GPS: Nord 43°26'13,5" Est 11° 11' 12,6"
BY CAR coming from the NORTH: On A1 highway, exit at Firenze Impruneta and take the highway junction towards Siena. Exit at Colle Val d'Elsa, stay on the right towards Staggia Senese, follow the signs to Lecchi. BY CAR coming from the SOUTH: On A1 highway, exit at Siena Bettolle and take the highway junction towards Florence. Exit at Colle Val d'Elsa, stay on the right towards Staggia Senese, follow the signs to Lecchi. BY TRAIN: Central Station Poggibonsi-San Gimignano. Lecchi is a small village born around a monastic foundation. History has brought this complex to the present state, do you wish to find out how the villa with the towers, the limonaia and the farm were built? Before your arrival, read where you will sleep and prepare to live a strong emotion!